One of the most pressing tasks in biotechnology today is to unlock the function of each of the thousands of new genes identified every day. Scientists do this by analyzing and interpreting proteins, which are considered the task force of a gene. This single source reference covers all aspects of proteins, explaining fundamentals, synthesizing the latest literature, and demonstrating the most important bioinformatics tools available today for protein analysis, interpretation and prediction. Students and researchers of biotechnology, bioinformatics, proteomics, protein engineering, biophysics, computational biology, molecular modeling, and drug design will find this a ready reference for staying current and productive in this fast evolving interdisciplinary field. Presents a cohesive and accessible overview of the field, using illustrations to explain key concepts and detailed exercises for students. Undergraduate and post graduate students enrolled in courses on bioinformatics, protein bioinformatics, proteomics, protein engineering, structural bioinformatics, computational biology. 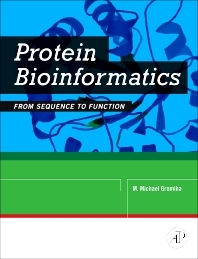 A protein structure oriented bioinformatics book has been long overdue and I would like to congratulate Dr. Gromiha for his efforts to fill this gap. Dr. Sandeep Kumar, Principle Scientist, Pharmaceutical Sciences, Research and Development, Global Biologics, Pfizer, Inc.